371 people in our community are currently praying with you. A Christian hymn composed by William R. Featherston in 1846. This rendition is by the Sharon Singers of the Sharon Mennonite Bible Institute. May grace and peace be multiplied to you. We have spent so much time on the writings of Paul and the four Evangelists, it seemed like a good idea to study the works of the other great founder of the Church, St. Peter. Peter was not a prolific writer, nor was he a great traveler like Paul, and he left us only two short epistles by his hand — 1 and 2 Peter. There is evidence, however, that the Gospel of Mark was partly the work of Peter; and indeed, it is hard to imagine how the eyewitness accounts of Mark could have been written without the knowledge of one of the early apostles. Simon Peter is always listed first among the apostles, and at many times he seems to act as their leader, or "first among equals". He was made special by the commission of Christ himself, for Christ told Peter that he was the "rock" upon which Christ would found his church. The Catholic Church puts great emphasis on this and teaches that Peter was the first Pope, with special powers to forgive sin as Christ's representative. 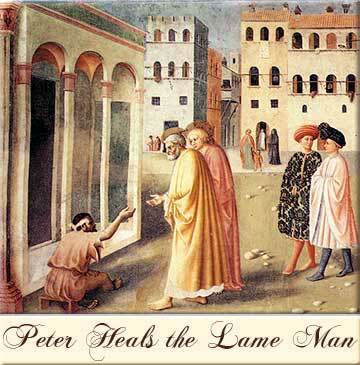 In fact, after Christ, Peter is the most important person in Catholic religious history. While Peter does not have quite the same status in Protestant churches -- most Protestants believe that grace comes directly from the relationship of the individual to God -- his position as first among the apostles and (with Paul) the great founder of Christian churches gives him a special place among Protestants, also. Peter was known primarily for his work with Jews, while Paul was more responsible for the conversion and leadership of Gentiles. Peter stayed in Jerusalem while Paul made his journeys and seemed to head the Council of Jerusalem, the center of Christianity. The Bible does not tell us what became of him thereafter, but there is strong evidence he later became the Bishop of Antioch and then traveled to Rome, where he became the first Bishop of Rome. We know that he was crucified; legend tells us that he was crucified upside down, as he did not think himself worthy to be crucified in the same manner as Jesus. At the start of this epistle, Peter appears to be addressing the Jews who were evicted from Rome by Nero in 64 A.D., which would have put him in his 80s. These would have been members of the great church he had built up in Rome, in exile, and so people that Peter would have considered part of his congregation. The five areas mentioned are all regions in modern-day Turkey. Matthew 5:14-16: You are the light of the world. A city on a hill cannot be hidden. Neither do people light a lamp and put it under a bowl. Instead they put it on its stand, and it gives light to everyone in the house. In the same way, let your light shine before men, that they may see your good deeds and praise your Father in heaven.